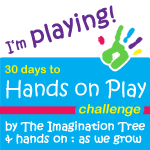 Day 7 and 8 of Hands on Play challenge. My daughter had fun with the big sheet of paper on the floor and some markers and crayons. She drew a rainbow, Rapunzel, and some other fun doodles. Since it was water fun today I figured they both needed a bath so we had fun their. The kids took a bath together and we had fun with the foam letters and numbers.